'Bite Me' is part of Etude House's 2014 Valentine's Day 'Seven Special Moments' collection. The entire series has names which depict different key stages of a relationship: from the honeymoon phase to the breakup phase, and unrequited love. My favourite name of the series is 'Love Me Forever'-- it just sounds so romantic and captures that princess-prince fairytale element of Etude House's brand. The bottle looks similar to Jo Malone's and is super tiny! 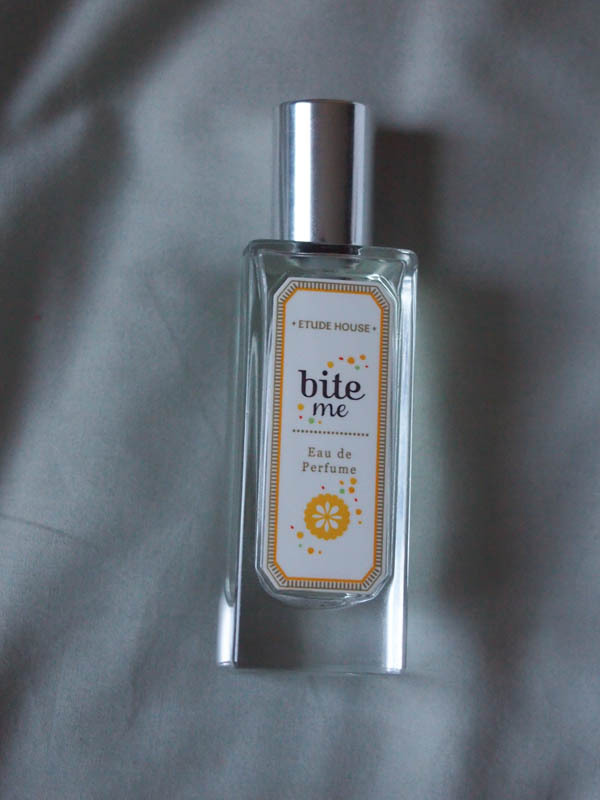 Out of all the scents, I loved 'Bite Me' the most and I had the chance to smell it when I was shopping with my cousin in Hong Kong. My cousin Christina (a different person to my bestie Christina) said she detested the citrus smell. I find it a refreshing grapefruit scent with a very light floral, musky undertone. I prefer sweet or refreshing scents rather than floral scents, and six out of the seven scents in this series contain some element of floral in it. None of the other scents really appealed to me. Although I enjoyed the scent, it has an extremely short staying power and only lasts around an hour on me. If I spray it on my wrist, I get an immediate rash-like reaction where my skin turns red. As an alternative, I just spray it onto my shirt. There is also a strong pang of alcohol for the first few minutes. I feel this alcoholic smell lasts longer than the usual perfume. It definitely has that 'cheap perfume' smell. Most appealing scent to me out of the entire line, but non-existing lasting power and a heavy alcohol undertone. I am unlikely to repurchase anything from this line again.